Whether you have area rugs over hardwood floors, or wall-to-wall carpeting, it is going to get dirty and stained. It is not cost effective to replace a rug every time someone spills something on it. 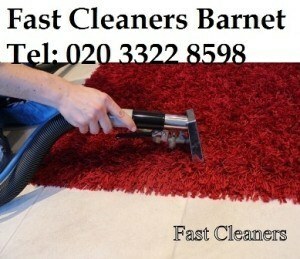 Fast Cleaners Barnet can clean your rugs, removing any stains, and saving you money. Our carpet cleaning service is performed by well-trained carpet cleaners so you are assured that your carpets are safe with us. Even if you vacuum your carpets every day, there is going to be a build-up of dirt and dust caught in the fibers. Spills and debris tracked in from outside will get ground into the rug in high traffic areas. Having your carpets regularly cleaned by professionals will not only keep them looking like new, but will extend the life of the fibers. The money you spend having them cleaned will be much less than what it would cost to replace them. Special rugs, like Oriental or Persian rugs, need special care and attention. Fast Cleaners Barnet has the knowledge and experience to clean these rugs without causing any damage to the individual fibers or knots. We have a dry cleaning technique that allows us to get out all the dirt and stains without using any water that could destroy the rug. When your rugs are clean, it makes the rest of the room look good. A dirty rug will make the house look dirty, even if everything else is clean. Our rug cleaning service saves you money and keeps your home looking great. Our carpet cleaning service along with other cleaning services are within reasonable cleaning prices so you no longer need to spend more just to have your carpets rejuvenated. Ask for a free quote on 020 3322 8598.